Second Wives Club premieres Thursday, May 4th at 9 pm ET on E!. Shiva Safai: The fiancée of mogul real estate developer Mohamed Hadid is looking to take her place as wife number three. Despite their 32 year age gap and his five children from previous relationships (including former RHOBH star Yolanda Foster), Mohamed and Shiva have been together four years and are helplessly in love. Divorcee Shiva is ready to walk down the aisle for the second time, and although Mohamed has put a ring on it, he’s taking a more relaxed pace on the road to marriage. He’s taking things in stride, showering her with love, affection and all the gifts his lavish lifestyle affords him. Katie Cazorla: Together over 11 years and engaged for almost six, Katie and her fiancé Walter are in love. Although Katie is poised to become Walter’s fourth wife, her commitment issues threaten to derail the wedding train. Between her burgeoning nail business and a new venture on the horizon, she struggles to balance her entrepreneurial spirit and giving Walter the attention he needs and deserves. 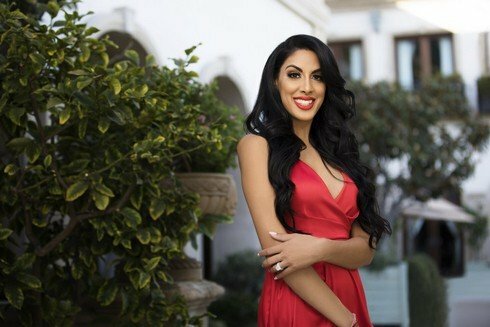 Veronika Obeng: The spouse of Beverly Hills plastic surgeon Dr. Michael Obeng, Veronika is Michael’s third wife. The pair has three children together and five children between them from previous relationships. In addition to being a doting wife and mother, Veronika is the general manager at his practice. With eight children, Veronika feels pressure to be the best mom, stepmom, wife, partner all without a single hair out of place. Shawna Craig: The fifth wife of Lorenzo Lamas, Shawna is a free spirit who has been in a six-year relationship with the Golden Globe nominated actor with heartthrob status. Despite some challenging circumstances, including Shawna being the stepmother to Lorenzo’s six children and even being a surrogate for one of his daughters (Shayne, wife of The Dirty’s Nik Richie), the couple’s love endures. After spending her 20’s helping to take care of Lorenzo and raising his children, Shawna is ready to step into the spotlight and devote herself to a modeling and acting career. Tania Mehra: With nearly 20 years between them, Tania will soon be Dean Bornstein’s second wife. However, having just three months to plan a lavish, over-the-top wedding with 300 guests has Tania feeling overwhelmed. Her Bridezilla tendencies have been revealed, and she will stop at nothing to make sure her wedding is perfect…which also means ruling her guest list with an iron fist. Morisa Surrey: With nearly 30 years between them, Morisa is the new wife of Dr. Mark Surrey and also a new mom to a beautiful baby boy. Blonde, bubbly, and irrepressible, she’s always putting her foot in her mouth, and the girls must often take the time to teach her that thinking before you speak is not just a motto, but a rule to live by. To check out a sneak peek – go here! TELL US – ARE YOU GOING TO CHECK THE NEW SHOW OUT? DO YOU THINK LISA VANDERPUMP WILL MAKE AN APPEARANCE?